Travel with Kevin and Ruth! : A lot of effort goes into the perfect cup of Colombian coffee! We arrived about 11:30am. We hadn't made a reservation...I just assumed that tours ran all day and that you simply show up. But we were very lucky. Don Manolo is a small personalized operation and the owner of the farm, Señor Hector takes you around himself, so we were lucky that he was there and available. We did the entire visit and tour in Spanish, but Hector and family were very patient and good about repeating things and making sure we understood. First, we sat at a big table on their beautiful patio overlooking the city. Ruth, owner Hector, and son Manuel. Hector went into a lot of detail about the economics of Colombian coffee production and drew us charts and supplied figures regarding the production numbers. Every grower in Colombia belongs to the F.N.C. 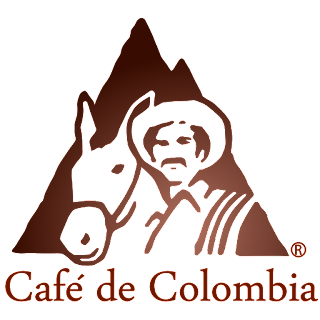 The Colombian Coffee Growers Federation and there are 550,000 families who belong to the group. 1,500 of those families are small technical growers of which Don Manolo is one. Coffee is the second most traded commodity in the world...next to oil! But Colombia isn't the largest producer in the world. That title belongs to Brazil, with Colombia number 2 followed closely behind by Vietnam. As Hector was explaining things, son Manuel was brewing us the perfect cup of coffee. Pretty fancy coffee making machine! Pouring a cup of perfectly brewed fresh coffee. And served with a delicious home baked brownie. After we finished our coffee and treat, Hector brought us out to his fields on the side of the mountain where 7,000 small coffee trees supply the fruit to make your morning cup. He explained the whole process, from planting the seed to growing the tree and fertilizing and nutrients to make it produce the most fruit. Señor Hector showing Ruth the coffee trees. Right now is not the best time of year for flowers, but it is for the fruit. Most flowers will be out again in January. One of the benefits that Colombian coffee growers have in this area is that the climate is such that they have two production seasons per year. Of course the coffee bean itself comes from the inside of the fruit of the tree. A ripe coffee "cherry", and a lot of unripe ones still on the tree. They taste slightly sweet, but I didn't think it had much flavor. And there's not a lot of pulp between the taught skin and the seed...so watch your teeth! There is a tiny insect which loves to use the coffee cherry as it's nest. Many producers use chemicals to rid themselves of these little pests, however Hector uses another insect that eats the small insect. It's not a perfect system, as he showed us some of the cherries that have been destroyed by the insect. Coffee production on a small farm is very labor intensive. The beans are all picked by hand, then washed, dried, and sorted by hand. They do have some machinery to process the beans themselves though. This machine removes the pulp. The beans are then dried here. It normally takes 8 to 30 days to dry the beans, depending on the weather. This machine removes the shell from the beans. He adds the husks to his compost which is then spread back on the fields. Next, the coffee bean is ready to be roasted. 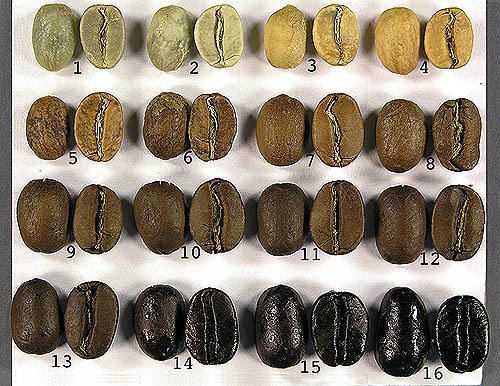 This is the process that perfects the flavor and there are different roasting preferences for different parts of the world. There is a scale ranging in darkness from 1 to 16. Don Manolo coffee is roasted 10-11. It's a pretty fancy roasting machine! It does maximum 7 kgs (15 lbs) at a time. While we're waiting for the coffee to roast, Hector serves some of his wife's home made ice cream with sauce made from the fruit of the coffee tree. Ha...look at the look on Ruth's face! It is then bagged in bags that have a special valve that only allows humidity out and not in. We bought a 1/2 lb bag for 8,000 pesos ($3.90 CAD). Totally a great tour! Cost is 20,000 pesos ($9.80 CAD) per person. I'm sure it depends on how busy they are, but we were fortunate that Hector and family were able to spend almost three hours with us. Very friendly people, and they know everything there is about coffee! The climate is not only good for coffee trees. Many other plants, flowers, and fruits do very well here too! These giant bamboos are so cool. They grow up to 10 cm (4 inches) per day! Another neat plant. I don't remember the name, but it was something like maraca. Beautiful view of the city from the farm. What a great day we had! Not sure what's on the agenda for today, but so far...the sun is shining! What a fabulous day. That is the coolest tour I have ever seen. Who gives coffee, brownies and ice cream on a tour? The bamboos are terrific. Awesome photos. Glad those guys talked you two into doing this tour. Great post. It was a great day and a super tour. The brownies, ice cream and coffee were all delicious and that is from someone who really isn't a coffee drinker. The bamboo is amazing and we can't believe how tall it gets! Wow! That is really interesting! Thank you for sharing! I really enjoy seeing places that I won't be able to go to so thank you again. Thank you Kay! We were happy to share this experience as it is one that not many people have a chance to do. Hopefully we can convince you and others to put Colombia on your list of places to visit. What a great tour... everything about it ... birds, flowers, scenery... and of course, coffee. What fun! We totally agree with you, everything on the tour was fantastic. Not only did you get to see a lot of beautiful scenery but you learned the process necessary to making coffee and you had fun doing it. The scenery was definitely a bonus on this tour. Never realized that so much is required in order to get the coffee from the seed to the table. It was a very interesting tour. Great! Now time for The Brujita!? Don't think we will be making the long trip out to the Brujital. As it is we know we aren't going to have as much time to do all the things we want so some things will have to be sacrificed. Wait, people still drink coffee? It's the 21st century! What a great tour and personalized too, thanks for sharing with us. Glad you enjoyed the tour, George. Very Interesting. Thank you for sharing. I will appreciate my java more tomorrow morn. What a marvelous experience! Thank you for sharing it with all of us. Even though I don't enjoy coffee, I would love to go on a coffee farm tour like you did! I am much the same way with coffee but I am starting to acquire a taste for it. The tour is great though even if you don't drink it. Thanks Kevin and Ruth for sharing. I now know more about coffee than I ever thought I would! I really enjoy reading about your adventures. We felt the same after we did that tour. Never knew so much effort went into making coffee. Thank you for taking the time to comment Darle and I hope we can continue to bring some unique adventures to our blog. Now that was a great tour! Thank you Judy, we totally agree with you. Yes, I love the smell of it too and I am starting to enjoy the taste of it myself but it is something that I don't want too much of. I think that Marti would like to come for a visit here and enjoy some of this liquid gold made right at the farm. Awesome tour!! I buy different coffees from around the world i.e. Hawaii, Colombia, Brazil, Arab, and others....by far the strongest are the light roast. I've had dark roast Arabian coffee that, in my opinion, were fairly strong. I'm not a heavy coffee drinker but I do enjoy a good cup of coffee at least twice a day. I'd love to tour Brazil's huge coffee planations....if they are large plantations. BTW I don't like flavored coffee but I like flavoring my own. I guess the taste depends on how the coffee is brewed and method used to brew coffee. I'll have to check into that coffee maker. I drip my coffee. Kevin was definitely the coffee drinker in our family but he has now found that coffee has an effect on him so now he doesn't drink it very often. I only drink it every now and again but w really enjoyed the tour and the cup of coffee. Yes, the darker the bean the stronger the coffee but it also becomes stronger if you put more coffee to water. Personally I don't think I would like to see a big plantation, it would be much more mechanized and more chemicals and fertilizers used. We really like this small farm tour and the very personal approach that was given to us. Good for you for understanding all that in Spanish. I wouldn't say we understood it all but we managed to understand enough to get the gist of it. They were very patient with us. We would normally have milk and sugar in it but it seems that the majority of Colombians drink it black and sometimes with sugar. Neither of us drink much coffee and we are learning to drink it the Colombian way. You could be right on that because sometimes if the water is too chlorinated we find our coffee and tea doesn't taste nice and that's when we need to use bottled water. What a great tour. We don't drink coffee but I love the aroma. That place looks like paradise! Ruth, it's good to see you look so healthy and happy and I love the barrette! Yes, we both love the aroma of coffee. I hardly ever drink coffee and Kevin used too but now drinks very little of it. I love how they have some many fruit trees on the property of all different varieties. I wonder if that would be called organic coffee? If it is, it isn't marked on the package as organic but from the way he was talking I would tend to think that it is. Perhaps for some reason or another it doesn't totally fit the criteria for organic. Enjoyed the tour and your travels. Your spanish must be good. The plant is a maraca or "Shampoo Ginger". As the name suggests used in shampoos as well as herbal medicine for the cure of stomach aches, sprains and I believe once claimed to kill cancer cells. Thank you Peter. Our Spanish isn't as good as we would like it to be but as I mentioned in a reply above, we understood quite a bit and that was enough to get the idea of what he was talking about., they were also very good about talking slower for us or repeating themselves for us. We were pretty sure that he had called it a maraca but we weren't totally sure. Thanks for the additional info on it. It was a pretty interesting looking plant. How cool to visit the coffee farm (and enjoy the coffee). Sure I remember: My name ... Juan Valdez. We visited a Kona coffee plantation last year on the Big Island and really enjoyed it (plus, it was all in English, always a plus for us English-only folks). Great photos of your visit. We don't watch TV anymore so not sure if they still have commercials for Juan Valdez or not but we certainly remember them from years ago. Yes, I am sure you managed to garner more info than we did having had a tour in English. We didn't mind though because it helped us to work on our Spanish. Downtown Seattle used to have a couple of Juan Valdez coffee spots. They served up good espresso. I don't believe they are there anymore. Thanks for sharing your trip to the coffee plantation. Great pictures! I never knew that Juan Valdez coffee shops made their way up to the USA. We see quite a few of them here in the cities but not like the way you would see Starbucks up there. So glad that you enjoyed the post and the pictures.